The first man to walk in space, Russian cosmonaut Alexey Leonov has taken part in jubilee celebrations and answered several questions submitted by social media users – 50 years after he took his historic first step into space. 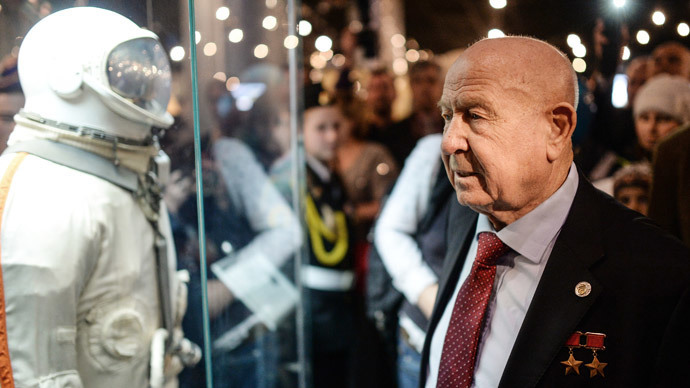 At the opening ceremony of the exhibition, dubbed “50 years: 733 spacewalks” that took place on Thursday at Moscow Museum of Cosmonautics, 80-years-old Alexey Leonov gave a speech, refusing to focus only on his pioneer accomplishment. Spacewalking is not just about walking, you have to carry out “installation and de-installation works,” as the father of practical astronautics Sergey Korolyov used to say, Leonov recalled. “This is the long way we traveled,” Leonov told the audience. Q:What did you tell your wife and kid before the mission? AL: Firstly, I told them I was going on a business trip. You have to stay here and wait for me. Where am I going? To the launch area. But nobody knew what I would be doing there. Q:If you get another opportunity to spacewalk, would you agree? Answer honestly. AL: I would agree, but it’s very hard to train. This is very difficult. All the folks will confirm, that as professionals working on a space station, everyone must be able to spacewalk and work in space. And experience has shown that’s the way it was. Q:Would you like to stay in the outer space for the rest of your life? Q:What would happen if a flea-infested cat gets into a spaceship – will the fleas be flying? AL: During all our experience of space missions the most intelligent question was addressed by a small girl from America. “If a spider is placed on board of the International Space Station (ISS), how will it weave his net?” That is a question. And I think fleas won’t leave the cat, because they feel good there. The 12-minute spacewalk could have ended up in tragedy, as Leonov’s spacesuit inflated like a balloon due to unexpected pressure problems. According to Leonov, he had to “deflate” the suit, thus risking decompression sickness. But it was only the beginning, as the crew faced even more troubles with oxygen, and a dangerous re-entry malfunction led to landing at an unplanned location. The two men found themselves in the middle of thick Russian taiga forest, with its subzero temperatures and wildlife. Leonov revealed that their three-day-long absence was explained by the media as having a holiday at a “secret dacha” – and joked that the very building “has not been constructed yet”. Then-pilot, Alexey Leonov eventually became a commander of the Soyuz 19 ship during the first joint Soviet-American space mission, Apollo-Soyuz, in 1975. After his retirement in 1991, the twice-Hero of the Soviet Union has remained an extremely popular public figure, who continues to share mind-blowing details of space exploration.